Block Twelve! WOW! All of a sudden that happened quickly. We've got a great last block for you. It was designed by Scott Hansen of Blue Nickel Studios. Scott and I "met" in a way that only quilters could meet. 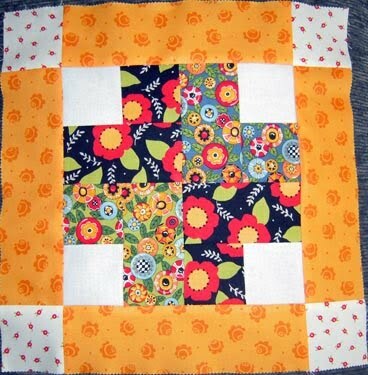 One of my quilting friends did a doll quilt swap and Scott was her swap partner. So I looked online to see who Blue Nickel Studios was. I know some of you know Scott, but for those of you who don't think you know Scott, you may know Scott through his quilts. Hop over to his blog and see if you recognize his work. I have always been creatively minded, but somewhere along the way, a lot of that got somewhat pushed back. Being a man, creativity is not so much applauded as is productivity, and I could not get the two to co-exist for many decades. Now I am working on remedying that. Back in 1995 or so, I was seriously thinking about leaving my life in retail for a different life in quilt-shop retail but never had the upfront $$ to get started, and didn't want to borrow money. Somewhere along the way, I decided that I would almost rather design than run a shop, but that may come along eventually. Through a long slow chain of Divine events, I am now at the point where I have been professionally designing quilts for the fabric companies of Free Spirit, Michael Miller, and Robert Kaufman so far and I have an upcoming Moda Bake Shop project as well. On the websites of those first three companies, you can find the free downloadable patterns that I have done for them (there is also a link on my blog to make them easier to find). I have been published now in more magazines than I can remember....but if I was to take the time, I could still probably count them on my fingers...(I think). I have four more coming out this fall and winter with 4 different magazines. I am also working on self-publishing patterns that will start off in PDF form selling online only, and as time goes on, getting them actually printed on paper and in shops all over the world. 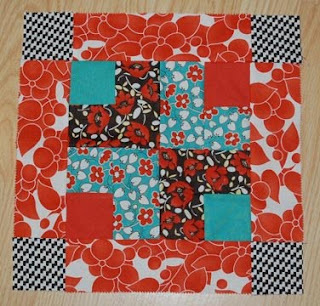 The block that I have designed for this Jelly Roll Sampler Quilt Along is going to be one of my first patterns with three different layouts in three separate color schemes. You can follow my blog http://www.bluenickelstudios.com/ for news on when and where those will be available. Besides magazines, I am also one of 30 men featured in Joe Cunningham's upcoming book Men and the Art of Quiltmaking, and I am thrilled that Joe included me in that book, as there are a lot of "bigger" names in the book as well, but there still aren't that many of us guys in the world of quilting (although I KNOW there are more than 30!!) I try to keep my blog fairly fresh with entries every so often, sometimes 2-3 times a week, sometimes I miss a few weeks, if things get really crazy around here with home projects, teenager stuff, or quilting deadlines. I still have that DayJob in retail that won't pay me if I don't show up either! :) You can always sign up for email prompts that tell you when I post if you want on the right sidebar of my blog. 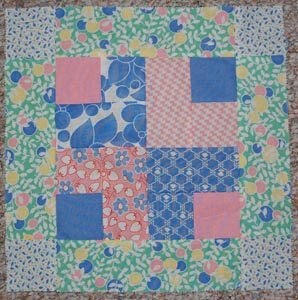 I was very happy to be invited by Konda to join in with the fun on this quilt-a-long, and hope to see you stop by my blog at http://www.bluenickelstudios.com/. If you stop by before the 5th of August be sure to join in the naming contest for the Blue Nickel Prop Girls here on this link http://bluenickelstudios.com/?p=2191 Fat Quarters and a Layer Cake bundle are being offered as prizes. 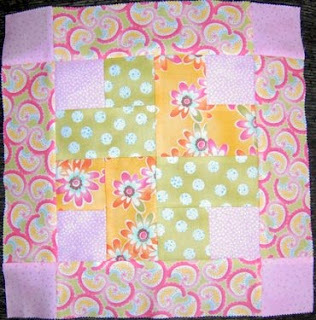 Also check out post #240 which as I write this isn't done yet, but it will have a prize that goes with Konda's quilt along as well. You know, I could just go on and on, but as it is an early Sunday morning, and it is the end of a week of wonderful vacation, I am just going to say thanks to Konda for the wonderful opportunity to meet you all, and please do stop by the Blue Nickel Studios site as often as you like, I love the company. Click HERE for instructions to Scott's block. and then with Swanky. In each case I used the background fabric as the -- well where the plain white is in Attitude Girls. Update: Yes, sorry, forgot to mention. . . . the alternate color schemes were causing problems with the pdf so Scott took them out of the pdf. The pictures that were there are those you see above. Thanks! thanks so much for hosting this-it's been fun and I can't believe we're nearing the end! It's been a lot of fun playing along. I was just wondering if I am the only one who cannot see the alternate colour schemes in the pdf file. Block 12, wow...and I'm all caught up too...another Wow! Great to meet Scott...can't wait to view his site! I like this one. Very nice, Scott, and it was nice meeting you. Ooooh.. I am looking forward to making this one. It seems simple and straightforward. I hope I have time to make it tonight. Great block! Thank you for creating such a fun event. 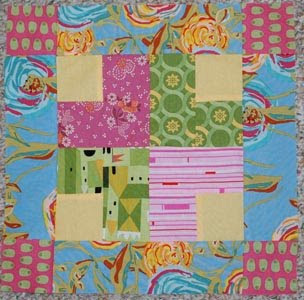 Oh, I love this block, thank you Scott and thank you Konda for hosting this great quilt-along. Usually I lag behind but NOT with this one. It has been so much fun and I'm looking forward to the setting.